What's the number of unread emails—right now, at this moment, without changing anything—in your inbox? That would be 3,487 in the case of Jen here; 1 in the case of Rebecca. More about what that means in a second, but first, a bit of backstory: The New Yorker's Silvia Killingsworth has embarked on an exploration of what she dubs in her headline as "Zero Dark Inbox," or having absolutely zero unread emails in one's inbox. She writes, "I have four e-mails in my inbox right now, but I’m aiming for that number to be zero. 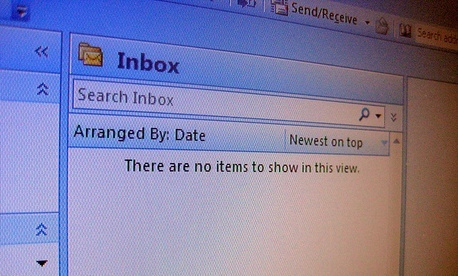 Like many practitioners of the 'Inbox Zero' system, I treat my inbox like a to-do list, with each e-mail representing a task...." She's adhering to a method promoted by Merlin Mann, a lifehacker and proponent of Getting Things Done; essentially, it's the digital version of opening all your letters (what letters?) and bills when you receive them and dealing with them then as opposed to setting them aside and waiting for the bill collectors to start bugging you to pay up (not that we would do that, of course). Killingsworth took on the pursuit of Inbox Zero for herself, calling it "exhilarating and terrifying"—fortunately, like many a process-and-detail-oriented person, "I am addicted to the gratification that comes from tidying up," she writes. Inbox Zero is a coping mechanism, a way to move on with conversations throughout the day; on the down side, entire threads may be forgotten, no longer staring you in the face. "And what about when you actually reach Inbox Zero? It doesn’t feel like winning. It feels like staring into the abyss," she explains. But there are at least many like-minded or attempting-to-be-like-minded commiserators with whom you can share your attempts to get there, so that's fun, sort of like a support group. But if Killingsworth and her ilk, wholeheartedly and diligently attempting to get to Zero, are one example of an email-lifestyle, what are the others? We undertook a brief investigation of the staff of The Atlantic Wire to find out What Our Inbox Numbers Say About Us (and therefore, perhaps, you too; remember ourbook readers diagnostic?). As for our unread email counts, here's what we found.